Ernest Goldsmith - Corn Merchant. He ceases trading on 24th June this year (SRB). Roland (Roley) James Wells - Boot and Shoe Maker. He is also the town 'Mace Bearer'. 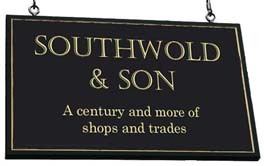 Roland's son, Herbert Noel Wells, also works in the shop as well as having a part-time job as a postman. 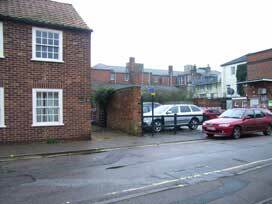 Demolished to make way for the supermarket car park. To read Steven Wells' memories of his father, Herbert, and grandfather Roland, click here. Nos 46,48 and 50 were demolished to make space for the supermarket car park. 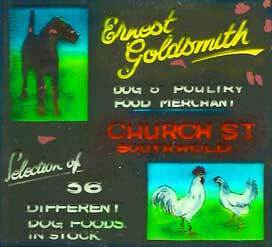 A 1930s Southwold Cinema advertising slide for Ernest Goldsmith.